Hello and welcome to 2018..about six months late! Just a short post today to apologize for neglecting my site and to update all you good folks on what has been happening around MarkTavares.com! I really do apologize for the lack of activity around here. It is not due to laziness I assure you. 2018 has been quite busy thus far. I have been involved in at least three group art shows through both the Creature Features and Mystic Museum Galleries in Burbank. The paintings for those shows have been added to my main “Current Work” gallery. (Unfortunate side note: About one month ago, Creature Features had to close the doors on their brick and mortar operation. The lease rates in the area were getting to be a bit much for them. The good news is that they are still around online and will be doing a variety of pop-up shows in the months to come!) During this time, I also decided it was time to get myself back into the retail arena. The best way to sell art is still face to face. With that in mind, in mid April I was lucky enough to become a vendor at the big Monsterpalooza show in Pasadena. After such a long absence from the show circuit of my “Humerus” days, it felt great to get back into harness. It was a really eye-opening experience! This brings us to the first of June and the big news that I have finally opened my own online art store! This was inspired by my Monsterpalooza experience. 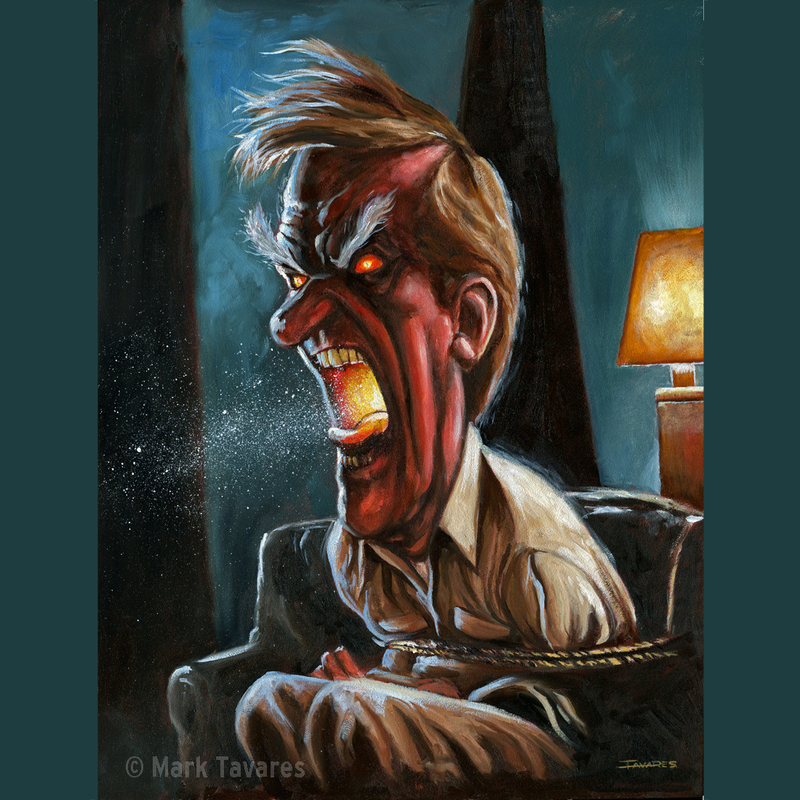 I have had a print-on-demand store through Fine Art America for a few years now. They are a fine operation but given their size it is very easy to get lost in the crowd. Also, I had no access to any of the sales contact info. I want to start developing a more personal one-to-one relationship with my clients. The shows, and now this store, are the keys to doing just that. I am starting off slow and just putting up some prints. Eventually I will be putting up originals for sale as well. Please come and visit the new store by clicking here or the “Buy My Art” link at the top of the page. It’s an exciting time with a lot of changes coming. As always, you can stay up to date by following my Instagram and other social media feeds. The 35th Anniversary of John Carpenter’s “The Thing”! Greetings MonsterKids! 2017 marks the 35th Anniversary of John Carpenter’s “The Thing”. In all that time, the film hasn’t dulled one iota. In point of fact, this tale of paranoia and distrust seems even more relevant in this toxic modern political age in which we find ourselves. For me, “The Thing” is one of my top ten favorite films of all time. It is required viewing at least once a year, usually around Halloween, and I get something new from each screening. It is still considered a high water mark of Special Effects Makeup that has been rarely surpassed even today. To celebrate the film’s anniversary, my friends at the Creature Features Gallery in Burbank decided to put together a show. I was invited, as were many of the other artists on the Creature Features roster, to contribute pieces. We were joined by artists from around the world whose work was being compiled for a special book of tribute art for the film’s anniversary. It was a huge show! It didn’t take a lot of brain storming to figure out what I was going to paint. In addition to the above listed reasons, another aspect of this film’s greatness is its cast of fully fleshed out characters. They are all very distinct personalities that contribute to the story. In fact, each one has one or more quotable lines of dialogue. As I knew that many of the artists would be focusing on the creature aspects of the film, I not surprisingly decided to turn my focus to these character moments and realize each one in a painting. I was so inspired I ended up creating three different pieces for the show! The second piece entitled “You’ve got to be F***ING KIDDING!” is another humorous moment that reflects the audiences reaction to the unbelievable mayhem unleashed on the screen just seconds earlier. The line is uttered by my second favorite character in the film, the stoner pilot Palmer. Folks may argue that his is the most memorable line of dialogue. Really, it’s a toss-up! 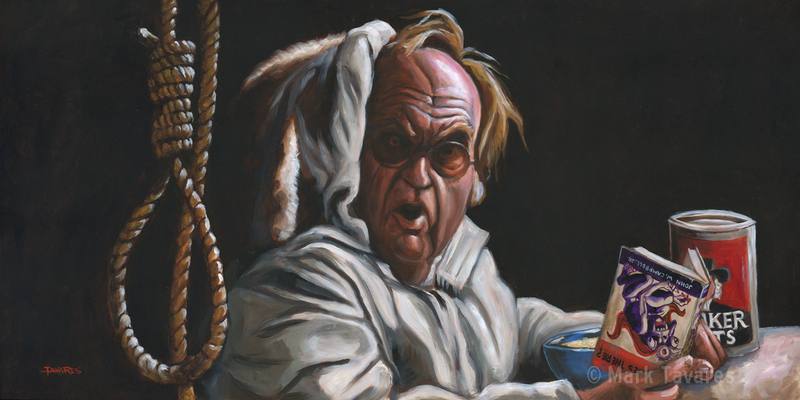 The third and final painting features my favorite character in the film, the scientist Blair played by the always interesting Wilford Brimley. Blair has what I believe is the most interesting character arc in the film. He brings authenticity to role, especially during the autopsy scenes. This painting, “I’m Alright Now. I Want To Come Back Inside!” takes on Blair at the point in the story where he has been cooling his heels in an outdoor storage shed after a violent outburst. Peering in through a peep hole/door, Kurt Russell’s “Mac” sees Blair eating some canned food. A makeshift noose hangs in the foreground. With this painting, I wanted to do something a little different. I came up with the idea to make the frame look like the snow covered door to the shed complete with open view port just like in the film. I am very proud of how this one turned out! ..and as it appears in the frame at the Gallery. The painting on display at the Creature Features Gallery. Do check out the show if you can. There are a lot of neat interpretations of the theme on display. If you are in the area, it is worth your time! Click HERE for more info! The show runs until April 16. (I know! It’s a short one!) After that we head into “Rocketeer” territory! Happy New Year 2017..if just a little bit late! I would have reported in sooner, but things have been hopping right from the start of 2017. I am actually working on a film project for the first tine in quite some doing some cartoony character/product designs. It is a lot of fun but also quite hush-hush. When I am able to say more, I will update the blog. On the personal side, I have a number of new irons in the fire. 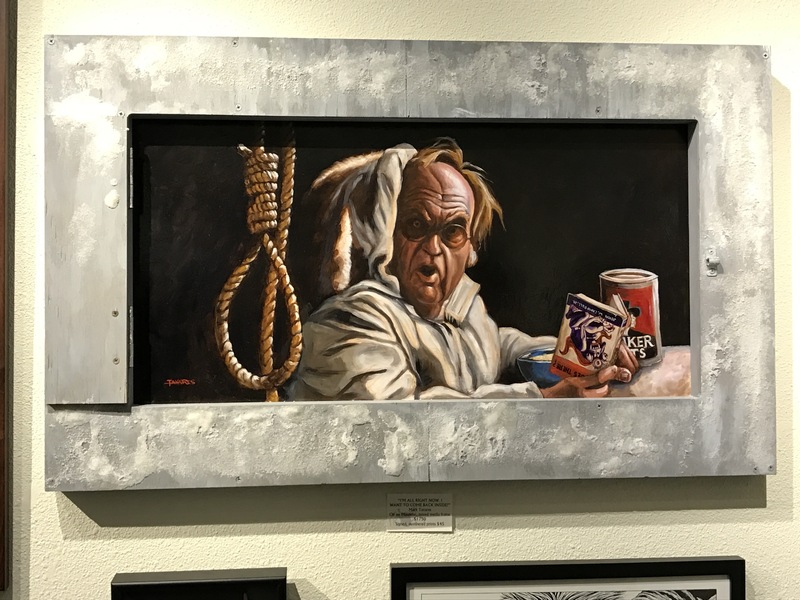 A wonderful gallery called the “Bearded Lady’s Mystic Museum” in Burbank recently premiered a “Twilight Zone/Alfred Hitchcock” themed group show. A number of folks I know were participating and I thought I should try to get in on the action. Despite being overbooked, the gallery owners very graciously allowed me to enter a painting. The Rod Serling portrait that appears on my portfolio page is now hanging on their walls. It was an amazing show that had crowds lined up around the block. I was quite proud to be part of this event and I hope I will get the opportunity to do more shows with them. I also had an idea for an original Hitchcock-themed piece, but there was no time to work on it as my friends at the Creature Features Gallery right down the street from the Bearded Lady announced a slew of group shows for the first half of the year. The first one was timed to coincide with the release of the new film, “Kong Skull Island”. This show was headlined by master illustrator and Kong enthusiast William Stout. They also had their usual array of fantastic artists covering the walls with all things King Kong. 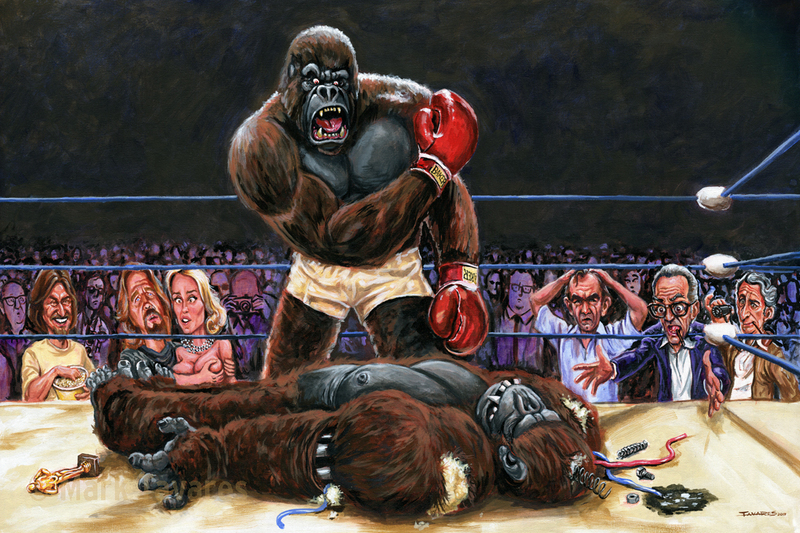 For my painting, I decided I would take a satirical swipe at the 1976 Dino DeLaurentis produced remake of “King Kong”. From a young age I have been fascinated with the saga of bringing this particular beast to the screen. For those not in the know, DeLaurentis decided that for his film, they would forego the traditional stop-motion animation that brought the original giant gorilla to life. Instead, they would utilize a combination of newer techniques; a performer in a gorilla suit and a full-sized robotic Kong. For the suit fabrication and performance, the production hired a then up and coming Rick Baker. You might remember him as the Oscar winning makeup artist behind “An American Werewolf in London”, Michael Jackson’s “Thriller” among many others. For the mechanical version, DeLaurentis hired his friend, mechanical effects artist Carlo Rambaldi (“Alien”, E.T.”, “Dune”). The story is long and there are several places on the web that probably tell it better than I could. Suffice it to say, Rick Baker has always regarded “Kong” as one of his worst job experiences. From the get-go he wasn’t treated with much respect. Being an ape enthusiast, Baker and team lovingly crafted the suit to look as much like a real gorilla as possible. Rambaldi’s robot looked like a bad wax museum display, but hey, it was BIG! The only problem was, it didn’t really work! Wearing the technically groundbreaking but cumbersome ape suit must have been torture. However, because Rambaldi’s full size ape was an unmitigated disaster and can only be seen in pretty much one or two shots near the end of the film, 99.98% of the shots had to be done with Rick Baker ape-ing it up on miniature sets. After all that work, guess who gets a special acknowledgement card at the end of the film AND a Special Achievement Academy Award at the Oscars that year? Yup! Carlo. While I always thought they had blinders on when it came to the quality of Rambaldi’s work, it turns out that may not have been true after all. I read somewhere recently that DeLaurentis knew early on that the full sized versions of Kong just weren’t going to work. He turned lemons into lemonade by inviting the press to the first day of shooting with the robot Kong. They got to see it do the one or two simple things it could do, and assumed that was how the effects would be achieved. Essentially, DeLaurentis..lied! I hope you liked it. The painting will be on display, for sale, at the Gallery for the next week or so. There are also numbered prints for sale. Head to the Creature Features website for info! More to come! Thanks for reading! Premiering November 2nd on IFC is a brand new comedy from Writer/Comedian Dana Gould called “Stan Against Evil”. It tells the tale of recently retired Sheriff Stan Miller (John C. McGinley) and newly appointed Sheriff Evie Barrett (Janet Varney) as they battle the 172 Demons that have descended upon their little town of Willard’s Mill, New Hampshire. I had the pleasure of seeing the first two episodes at a recent screening and the whole thing is quite funny! There are a number of references that could only have come from the mind of Dana Gould. It is fair to say that it occupies some of the same territory as “Ash VS. Evil Dead” but that’s okay. There is plenty of room there for everyone, AND it’s free! My connection to the whole thing came about recently. I have been fortunate to work with Dana on a number of posters for his recent Stand-up gigs around the country. We share a lot of the same geek sensibilities which makes the assignments a true pleasure to work on. 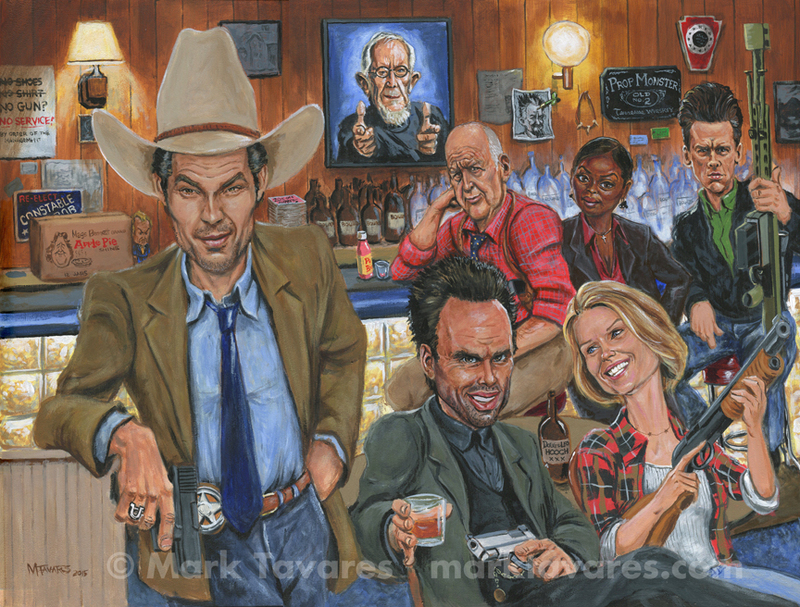 Having been aware of the painting I did of the cast of “Justified”, Dana inquired about the possibility of my doing a painting as a wrap gift for his cast. How could I say no? With “Justified”, I had seven seasons of material with which I was very familiar. “Stan” hadn’t even premiered yet. All I had was a reference shot of lead John McGinley. So, Dana gave me access to rough cuts of the first two episodes. It’s good to be the Executive Producer! After reviewing those, I had a good idea of the tone. I then set to work sketching a few ideas. Dana’s main requirement was for the setting to be the Witch’s Graveyard from the show. In addition to the videos, he also gave me some nice photo reference of the cast and the location. Armed with all of that, a design was agreed upon and I set to work on the painting. This was what emerged a short time later. Dana and I both referenced Al Jaffee’s “Fold-In” illustrations in the back of every MAD Magazine as a style reference for this painting. I hope I managed to capture some of that essence here! I highly recommend checking out the show. Head over to IFC for details by clicking this LINK! Hello! Once again, my good friends at the Creature Features gallery in Burbank, CA have put together a great group art show in which I just had to participate. Actually this is a sequel show if you will; the “All Art Attack 2” Group Art Show. As you may recall, the last time this was done, the world was celebrating the 60th anniversary of the much beloved Giant Lizard, Godzilla. The sequel show is happening because we are close to getting TWO new Godzilla films and probably just because it’s a fun theme. Given the amount of attention the opening received from contributing artists, the media, and the public, I would bet heavily on the latter reason. 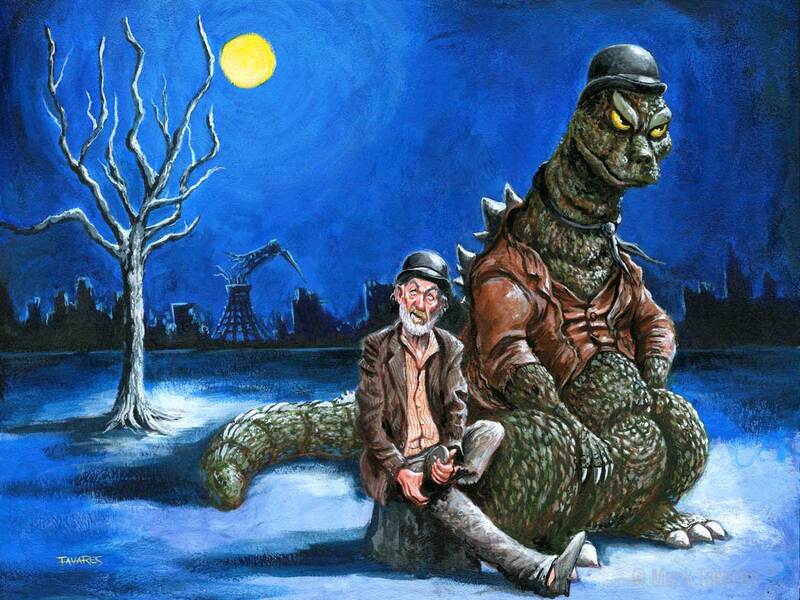 As far as my contribution to the show, I went for something somewhat obscure and brought together the worlds of Godzilla & Godot. I give you “Waiting for Ghidorah”. Now, having expressed a deep love for the Giant Rubber Monster film genre in the past, one would think I would have a warehouse of ideas ready to go for an occasion such as this sequel show. That was not the case though. I was suffering through a bout of severe “painter’s block” you might say as the deadline crept closer and closer. Enter my my very creative friend and former business partner, Brett Dewey. My old Humerus buddy and I share a great many geek tendencies. So, when I happened to casually mention that I was having troubles landing on a concept for this show, he did what he always does; carpet bomb me with all sorts of fun parody, mashup, and current events inspired ideas. Of the many great suggestions, the “Waiting for Godot” turned “Waiting for Godzilla” parody was the one that caught my eye. Like many folks, I had always known of the phrase “Waiting for Godot” and that it was from a play. (Admittedly, I was only half-sure about the play part) Researching it, I was fascinated by the basic story and the visual possibilities of dropping the G-Man into it. I was completely sold when I saw pictures of several different productions including a 2013 Broadway run with Ian McKellen and Patrick Stewart. I just had to see Gandalf sitting next to Godzilla on a sparsely designed set wearing hobo clothes! The show runs until August 28. If you are in twin, do head over there and check it out. In case you were wondering, the painting is for sale. There are also a limited number of signed prints available for purchase. Click on this link for more info! Willy Wonka meets James Bond! Hello all! Once again, I find myself fortunate enough to be participating in another fun group art show hosted by the Creature Features Gallery in Burbank, CA. This show is called “Twits, Whizzpoppers, and Snozberries – The Roald Dahl Group Art Show”. As the title suggests, the show is paying tribute to Mr. Roald Dahl, the author of such classics as “Charlie and the Chocolate Factory”, “James and the Giant Peach”, and “The BFG” (the movie adaptation of which opens quite soon). For my contribution to the show, I went for a mashup, sort of Willy Wonka meets James Bond. For those who might not be aware, Mr. Dahl in addition to writing the above mentioned children’s classics, also penned the screenplay to the James Bond film, “You Only Live Twice”. To promote the film, legendary painter and illustrator Robert McGinnis was brought in to create what I feel is some of the best key poster art ever realized for a Bond film. One piece in particular is his interpretation of a moment from the film wherein Bond, played by Sean Connery, is being bathed by several lovely Japanese women. It’s a ridiculously sexist image that perfectly encapsulates the James Bond attitude of that era. To drop Gene Wilder’s Willy Wonka character into that visual along with a few OompaLoompas to me felt like the perfect way to push it all over into absurdity. So, here it is! “The Suspense is Terrible..I hope it lasts!” © Mark Tavares 24 x 18. Acrylic on Masonite. The show opened on 6/26/2016 and will run for the next couple of weeks. The painting is for sale. There are also a very limited run of numbered prints available for purchase at the show. If none of that works for you, you can always purchase a print from my online print store by clicking on this link, or hitting the Buy Prints link over in the menu! 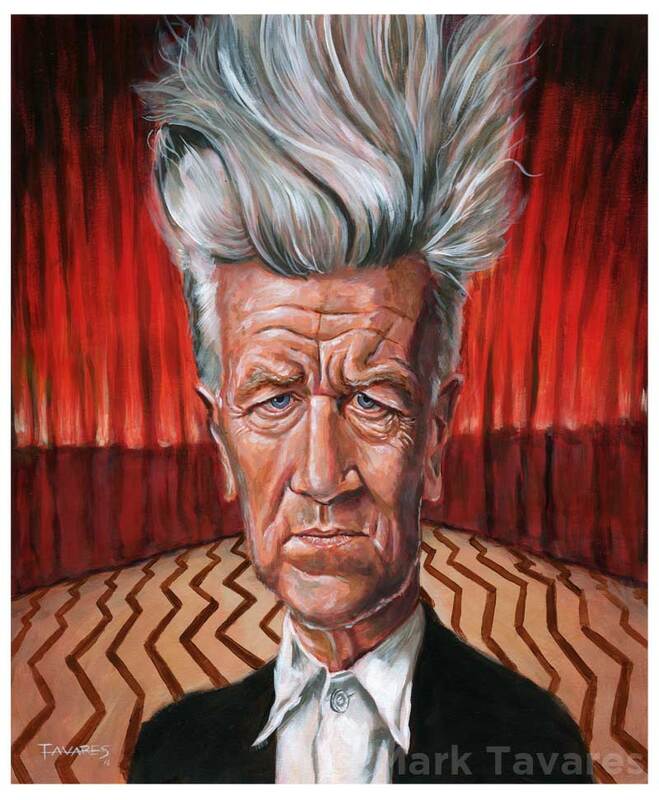 I am a little late on posting this here, I know, but Happy Birthday David Lynch! This is a little something I painted as a sort of birthday card to the famed director and monument to Eccentricity. Given that a new “Twin Peaks” is on it’s way to screens sometime in the next..however many years, I thought this would be an appropriate background. Now that “Justified” is about to head off into the history books, another show has returned to play out it’s final act. As of this writing, “Mad Men” is airing it’s final six or so episodes. I have to admit, I never got into the series. My wife and I watched the first season on DVD. We saw it through to the end, but it never grabbed us the way it has so many others. Even so, I do appreciate how the show has managed to truly capture the visual style of the era in which it exists. 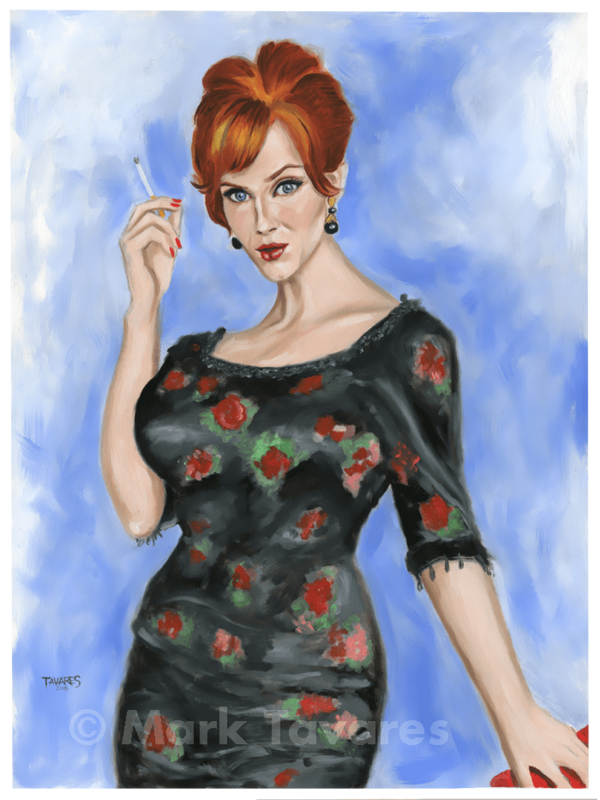 So, to usher it on it’s way, I thought I would try to channel a little Robert McGinnis and paint a few portraits of the stylish residents of the “Mad Men” universe starting with everyone’s favorite redhead! More to come! Thanks for looking! Friday, February 27th 2015, a man who was an integral part of shaping my childhood dreams left the stage. 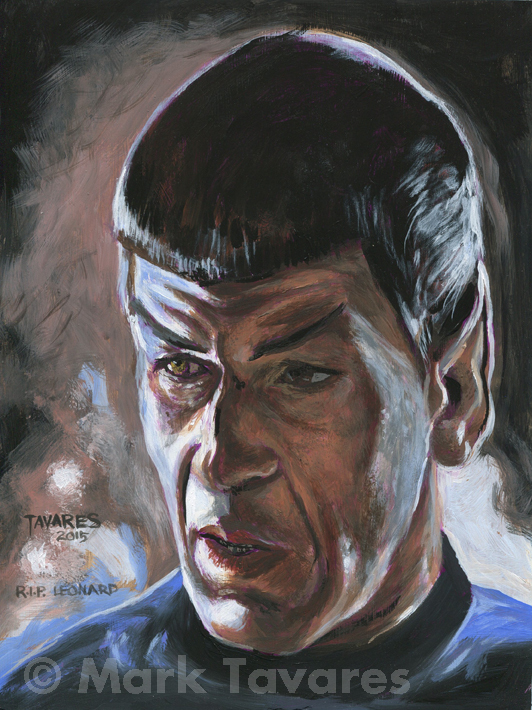 Leonard Nimoy who was best known for his portrayal of..(wait, do I really need to say?) succumbed to late stage COPD. I will sidestep the usual listing of his career accomplishments. There are many fine sites out there that do it better than I ever would. I will just say that as the heart and soul of “Star Trek”, he was the glue that brought everything together and made that program not only a wonderful escape to other worlds but also the catalyst for generations of fans to pursue careers in science, space, and in my case, the arts. I always hoped that I would one day get to meet Mr. Nimoy to shake his hand and maybe let him know what the show meant to me. Well, as it turns out, I got to meet him twice; once by accident and once by arrangement. Both times were somewhat embarrassing. The second time was much worse than the first. Let’s just say I didn’t get much of a chance to praise him before we were ushered out the door. While I had been annoyed throughout the years about the missed opportunity, it did make for an amusing story. Now that he has passed, I find that the embarrassment has washed away and in it’s place is a deep sense of gratitude that I actually did get to meet him. 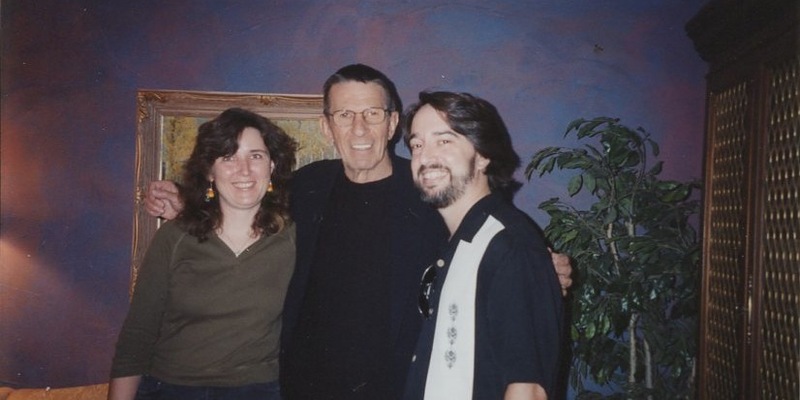 Erin and I get to meet Leonard Nimoy. YIPPEEE! Some day, down the road, I will relate the story behind this picture. It’s FUN! For now, having been taken aback by the announcement of Mr. Nimoy’s passing, I needed to do something. So, I put aside my current project and it’s pressing deadline, and just painted a little something for me. Thank you so much for all you gave to the world! Rest easy, Mr. Spock! This was something about which I had to keep my trap shut. Now, all can be revealed. This season is the final one for the FX network show, “Justified”. This show has been a favorite of mine from the get-go. It has great characters, crackling dialogue, and like most of the original programming on FX, it pulls no punches. I highly suggest Netflix-ing it if you don’t already watch. A few weeks back, I was approached by my friend, John Harrington, who is the Prop Master for the show. It is customary for cast and crew departments to exchange gifts at the end of a series. John wanted to do something unique. 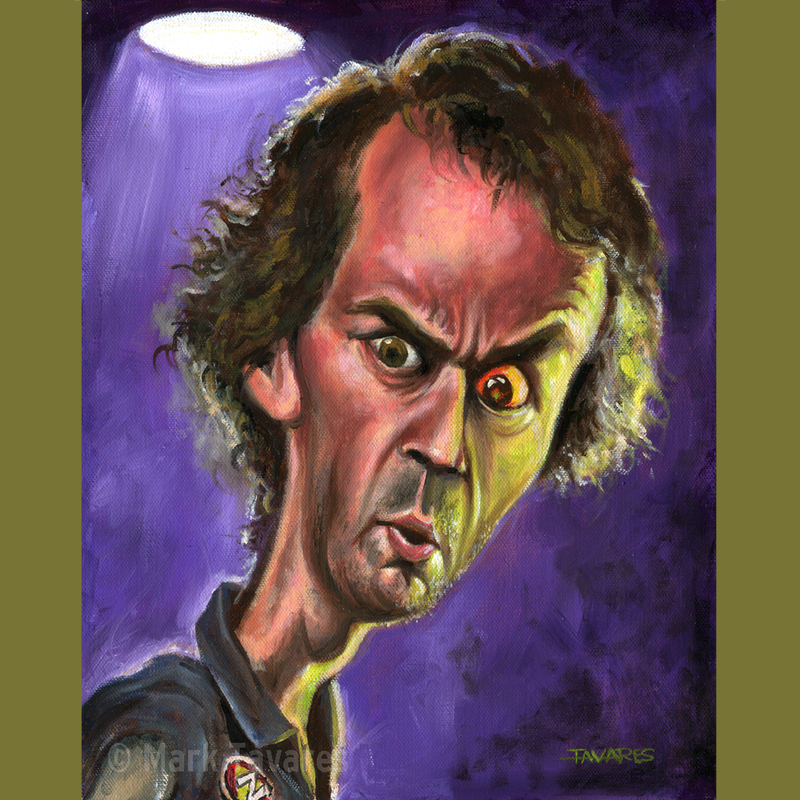 Knowing my fondness for caricature, he hired me to create this painting. John wanted something a little reminiscent of Jack Davis in style and humor, but not as kinetic. I sketched up a few ideas and we went with a portrait of the main characters hanging out in Johnny’s Bar. Even though we decided to limit it to the main cast, I had to try and get some of the other terrific characters from the show into the painting as well. I included as many “shout outs” as possible in the background, not the least of which being author and creator of Raylan Givens, Elmore Leonard. ..and yes, just like on the show, everyone is packing heat! Prints were made and are being distributed to the cast and crew even as I type this post. I do hope they like them. It was a tremendous honor and pleasure to be able to give something back to one of my favorite shows on television! The even better news is that once the cast and crew get theirs, I can offer prints for sale through my Fine Art America store. So, stay tuned! All content copyright © Mark Tavares (unless otherwise specified) All rights reserved. No images may be used whole or in part without written authorization from Mark Tavares.